The princess’ best friend is a unicorn obsessive so I made a unicorn card for her birthday! Her birthday was actually at the beginning of December but rather rubbishly she has only been given her card and present today. 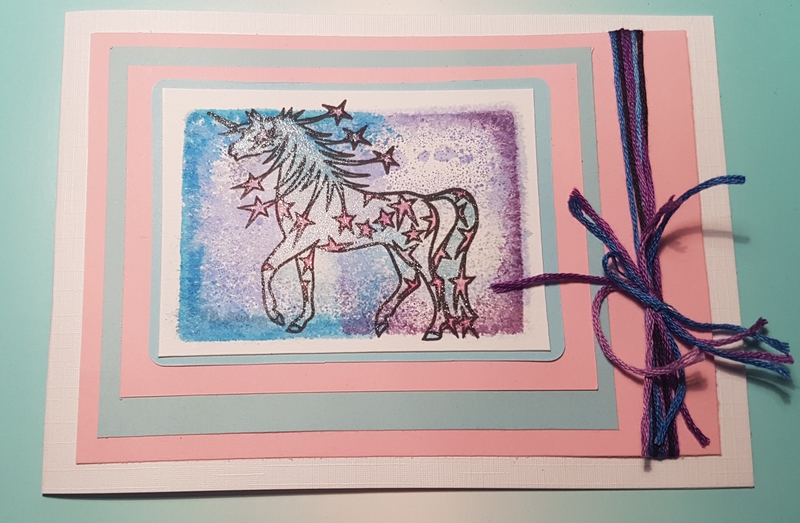 I used one of the gelli plate backgrounds I made a while ago as the starting point and added some additional colour to the Claritystamp unicorn. Then I added plenty of wink of Stella to make it brilliantly shimmery! I added lots of layers of pink and blue cardstock and then some blue and purple thread wrapped round and knotted. So happy belated birthday Millie! I also have quite a few backgrounds left that I have not had a chance to turn into cards yet… hopefully will be able to soon. So do watch out for the rest of the backgrounds in the future.